WHY ARE MARCH FLIES A PROBLEM? March flies are members of the fly family and certain times of the year, they will become a huge nuisance along roadways and in the yard. They’re active in many regions of the United States and seem to have two primary seasons. The first is in spring, during the months of April, May and June. The second season is in the fall and usually during the months August, September and October. March flies are well known even though their season is short and limited. This article will explain some basic biology of the March flies, explain why they are a major problem and what can be done to minimize and treat local infestations. As stated above, March flies are in the fly family. Their life follows that of most any insect; from eggs are hatched larva which then pupate and hatch as flying adults. This cycle can occur once or twice a year depending on local temperatures, food supplies and water availability. March flies vary in color. In some regions, they’re all black but its not uncommon for them to be half black and half orange or even all orange. Clearly March flies do better when it is wet, damp and humid. Moisture leads to plant growth which in turn leads to more plants and organic matter available on which March flies like to feed. Eggs are laid on such matter; places like water ditches, catch basins, swamps and fields. Landscaping around homes can present some prime food plots as well. Mulch, compost and flower beds will all contain the very food and moist conditions females seek when they are looking to lay some eggs. As flying adults, males have one thing on their minds: find females. Females have two things on their minds: first, find a male and then second, lay eggs. Both must do these tasks quickly since they only live a few days. In fact, it is quite common to find them mating as they fly. Once she has successfully mated, females can begin to lay fertilized eggs and will do so as long as she stays alive. To help maintain their energy, March flies will settle and alight during the evening and night hours. During this time they will feed on the nectar and honey dew found on their host plant. Come the light of the next day, they will be ready to go back to the air seeking mates and places where eggs can be laid. It is during the daylight that March flies become a problem. During this time, males will do nothing but follow females. Females will seek good egg sites and consequently, massive swarms of these flies will form. Since females are searching for good places to lay eggs, they tend to be attracted to areas which produce methane or Co2 gas; both are associated with decaying organic matter. Car emissions have similar gases so consequently, March flY swarms will find their way onto highways following the gases released by automobile exhaust pipes. It is here where March flies have earned their notorious reputation. March flY swarms can get so large and thick that drivers cannot see ahead of them. This in turn can create a dangerous hazard. It is quite common to see motorists pulled over waiting for the swarm to pass. Only then can they get back on the road and drive safely. Around homes and in the yard, swarms will find compost piles, water filled ditches and other swampy areas which can be excellent places to lay eggs. And they love pools! If such areas are adjacent to a house, March flies will start to roost on the home and eventually find their way inside. Homes with a leaky roof or siding that maintains more then a normal amount of water will certainly attract March flies and can even serve as a viable nest site. 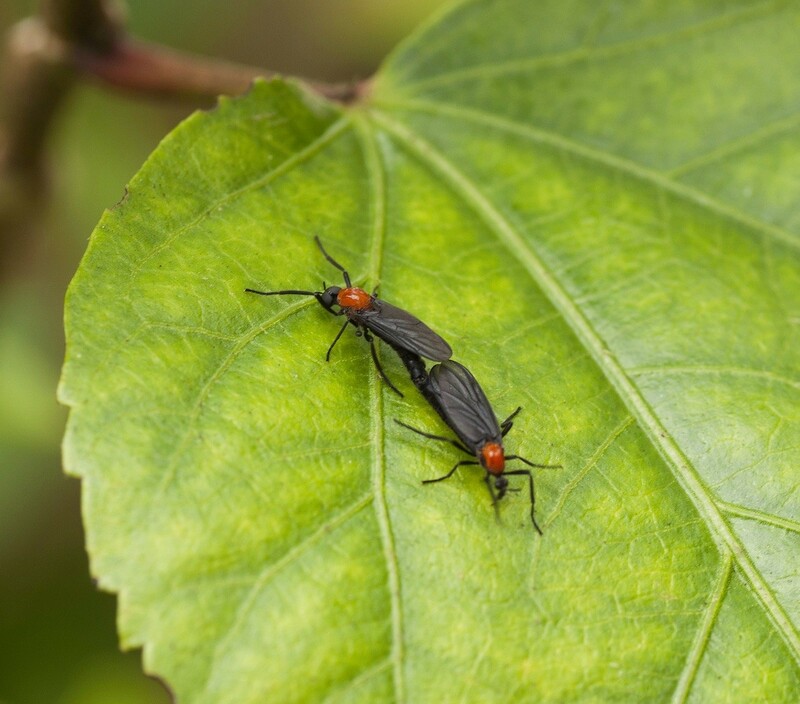 If have March flY activity in your yard, expect to see their swarms alight and congregate more and more from year to year once the problem starts. If you have a well landscaped yard with plenty of flowers and other plants which produce nectar and other sweet smells of plant life, they’ll keep coming back as they need nectar to fuel their swarming. Aphids and whiteflies allowed to live in your plants will cause the release of honey dew which in turn will attract feeding March flies. Such invasions can become messy and relentless. Worse yet is that once they start, they don’t seem to ever stop. The members of any swarm will die off within a week yet once they are found in or around any property, expect them to come back year after year if you don’t take some defensive measures. These measures will help to kill off local invasions so they don’t find their way into your home and become established. When March flies are in season, you may find yourself having to wash the car daily. To help with the removal of smashed March flies on your automobile, use BUGSLIDE. This product is will both remove dead bugs and once in place, prevent them from sticking to your windshield, grill, headlights, etc. Basically Bugslide is a premium non-abrasive, waterless, deep cleaning protector. Simply spray a small amount on the included micro-fiber cloth and wipe over the surface to be cleaned. 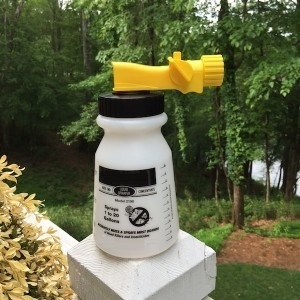 The pine jug below is enough to treat the average car 2-3 times and comes with the required micro fiber cloth. Click on “more info” to order the 64 oz refill jug. Around the home, March flies can be a non-issue when hanging around plants or flowers. In fact if just a few are present, they will barely be noticed. However, as soon as their eg laying efforts start to hatch and significant swarms form, they will take over shrubs, flowers, trees and any plant they find which releases nectar or honey dew. From there they will move onto homes and become a major pest even though they don’t bite. So if you have March flies active in any part of the yard and suspect they may be targeting this area to use it as a breeding ground, start applying CYONARA to all the turf, plants and home siding. Treatments will quickly kill adults and if you used once a week, should eliminate the swarms immediately and prevent new swarms from forming. If you have a large lot to treat, consider getting a fogging machine. These units will cut down on the time required and use a lot less chemical. For example, the average 1 acre lot will need 40 gallons of water in liquid form along with 6 oz of Cyonara to treat. But if using a good fogging machine like the FM6208 or the SOLO BACK PACK MIST BLOWER, you’ll only need 3 gallons of mixed product. When fogging, the mist does a superior job of coating all the plants where March flies like to roost and can do so in a fraction of time. This means within 1-2 seasons, the investment will pay for itself. 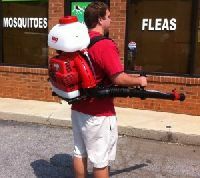 Plus they can be used for any other flying pest like NOSEEUMS, MOSQUITOES and GNATS. The SOLO MIST BLOWER is gas powered and well suited for any yard. It features a 3 gallon holding tank which is enough product to treat at least an acre. Add .5 oz of Cyonara per gallon of water and treat all vegetation, home siding, etc. where March flies are active. This blower can propel the mist 50 feet or more in any direction. If the invasion and swarms have found your home and you’re finding March flies active in living areas, there are a few treatment options to keep them under control. March flies will commonly be active around windows and doors. For these areas, PHANTOM AEROSOL is ideally suited. Its odorless and goes on dry. Spot treat the surfaces where you see them landing and over the course of 2-3 days, the Phantom will kill them. Mind you Phantom is not a contact killer which means its slow acting and won’t kill them in a day. But this is by design so don’t panic. Basically the product is designed this way so insects will not detect its present. This means they’ll remain on treated surfaces thus assuring their demise. 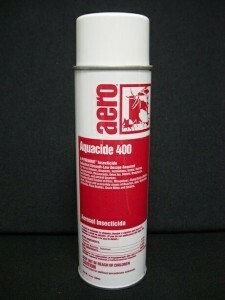 Lastly, if you just have the occasional March flies flying around, space spray any room using AQUACIDE AEROSOL. This water based space spray is ideally suited for flying pests and can be applied as often as is needed. It uses pyrethrin as an active which means there won’t be any lasting residual. But its very safe for use in the home and won’t pose a hazard to people or pets so then can remain even when treating. Remember that Aquacide is a not a true “cure”. So if you have a large population of March flies outside the home, treating the yard will help stop them from invading. One other tool you might consider is the HAND HELD ZAPPER. Its a quick and clean way to kill March flies both inside and outside the home. These devices are fun to use, powered by batteries and will kill any insect on contact without making a mess. They work for mosquitoes, bees, wasps, spiders and just about any crawling or flying pest making them handy to have around the home. 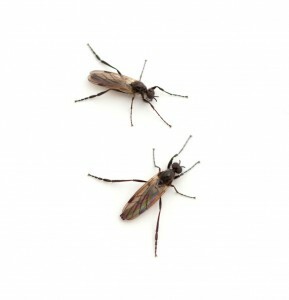 March flies are a major problem for 1-2 months each spring and fall in many parts of the United States. Their swarms invade yards, homes and roadways. March flies create dangerous driving conditions and their dead bodies, which accumulate on our autos, will pit and burn through most any wax finish. Treat your auto with Bug Slide to allow for easy cleaning when swarming season is active and your car is likely to become messy. Keep a Hand Held Zapper around the home for fast control of March flies which get inside. 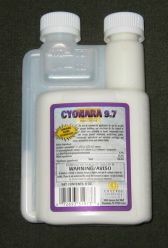 Use Aquacide Aerosol inside living spaces if they’re invading and be sure to spray buildings, landscape and plants with Cyonara to control local populations outside the home.